On Friday evening I managed to escape the house for the first time in weeks when Jane and I attended our friend Andrew’s 40th birthday (dinner) party near Stirling. It was great to be out of my bed and amongst friends for an evening; although I am paying for it now in terms of energy. It’s now nearly eight weeks since I came down with viral meningitis which affected my eyesight very badly and landed me in hospital for six days. My recovery has been slow but generally steady. I’ve been back and forth to Victoria hospital for various ophthalmology tests and at the last appointment I had with the consultant she was satisfied that my eyesight issues were related to the meningitis and that I should continue to see steady progress. I saw the GP last week too who gave me new painkillers for the ongoing headaches, which he thinks are partly related to the meningitis and partly to do with the eyesight issues. One of my work colleagues asked me on the phone last week what I’ve been up to while off sick. The first couple of weeks I spent mostly sleeping. My energy levels were in my boots, and my eyesight was so awful I couldn’t read, so I mostly lay in bed listening to Chain Reaction interviews on BBC iPlayer Radio on demand. During the next few weeks, as my strength grew and my eyesight improved a little I pottered around the house tidying. The house is now the tidiest it’s been for probably years. I’m now turning my attention gently towards the shed and the garden before winter overtakes the lawn. Of course, some days I’ve over-done-it a little, as I try to find what I’m capable of. Usually, I’ve been able to sleep it off the next day. I’ve also spent a lot of time with my three boys, Reuben (5), Joshua (5) and Isaac (3) which has been fun. Exhausting at times but definitely great fun and nice just to hang out, be silly, and bond. Because of my eyesight issues (unable to focus properly, flashing images, double vision, and blind spots) I’ve not been able to read very much. I love to read, and with so much time available it’s been quite frustrating not to lose myself in a book. If nothing else this experience is teaching me to be patient. My phone has been quite a lifeline, and even at the height of my eyesight issues I was able to make out words on my smartphone if I held it very close to my face, and closed my right eye. Ironically, it was only as my eyesight was improving that I discovered the Android accessibility tools. I’ve not been on my computer as much as I normally would, either. Again, this has been linked to my eyesight issues. About a month ago I was able to use my computer only if I either reduced the screen resolution (how many pixels you can see on the screen at once) from 1920 x 1080 to 1024 x 700, or if I used the Windows built-in screen accessibility tools and zoomed everything to 300%. It’s been a bit easier to use my PC over the last couple of weeks but my eyes get really tired more quickly, and I suspect that also affects the headaches. I did manage to move my email to Gmail, though, which felt like a massive success, given the circumstances. And I’ve not been able to cycle, which has been disappointing. We’ve had some beautifully clear days. I love to cycle in the early autumn when the air is clear and dry but the temperature is lower and the roads are not yet strewn with fallen leaves. I have been trying to get out for a walk every few days though, and gently build up some stamina. Although my GP told me last week that he expects it will take me 4–6 months before I’m fully fit. Thanks to Jane’s parents and younger sister we were able to get away for an evening and overnight stay to attend our friend Andrew’s 40th birthday gathering near Stirling (about a 90 minutes’ drive from Anstruther). It was great to be out of the house and not going to a hospital appointment. 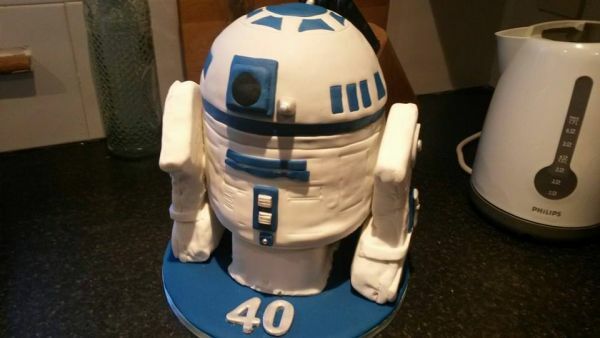 It was great to be amongst friends, for some fun chat and silliness, and to eat Jane’s delicious R2‑D2 cake (photo above) that she’d made for him. We stayed the night in the nearby Dunblane Hydro, where I spent an uncomfortable and largely sleepless night, and in the morning we invited another friend, Rich, over to join us for breakfast. When I got home I felt exhausted but happy. It had been a good 24 hours. And today… well, today I mostly slept. The body is made from two Victoria sponge cakes ‘glued’ together with raspberry jam. 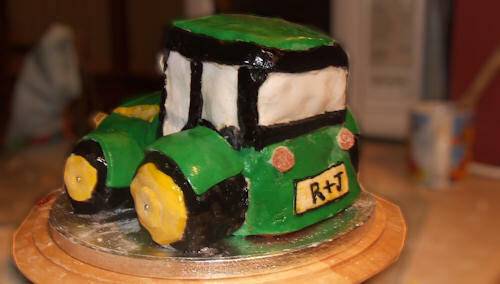 The wheels were cut out of another Victoria sponge using scone cutters and covered in black coloured icing; they’re stuck to the tractor body with butter icing (and prayer). 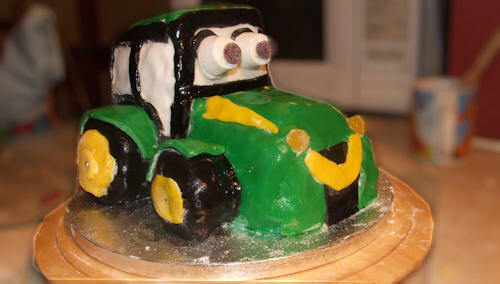 The eyes are made from marshmallows and jelly tots, which were also used for front and rear lights. The personalized number plate (R+J) was a last minute idea for which we used “writing icing”. 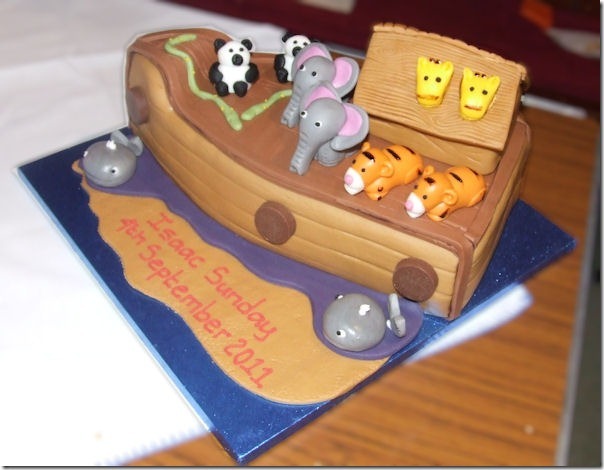 It was the first time that either Jane or I had ever decorated a cake like that, but we made a good team. If only Michel Roux Jr and Masterchef dining expert Gregg Wallace had been on hand to offer a running commentary. We took photos throughout the process of building it. I’ll upload them to Flickr in the morning and link to them here. Off to bed now, I think.